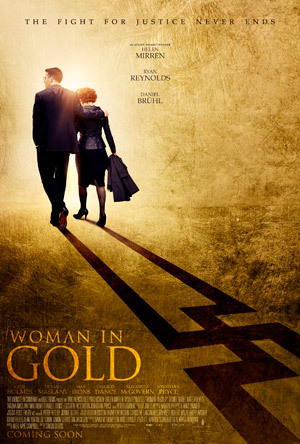 Helen Mirren, Ryan Reynolds and Antje Traue star in the drama ‘Woman in Gold’, based on the book The Lady in Gold by Anne-Marie O’Connor. A Jewish refugee (Mirren) and her lawyer (Reynolds) take on the Austrian government to reclaim Gustav Klimt’s iconic painting of her aunt (Traue), Portrait of Adele Bloch-Bauer. MPAA Rating: PG-13 for some thematic elements and brief strong language.